I get contacted about puppies pretty often. Not as often as if I had puppies available every year, but still, pretty often. Messages that just ask, Do you have any female puppies and how much are they? get short answers. The implication that I would just hand over a puppy to anybody who handed me cash is pretty insulting. It also shows they haven’t looked very carefully at my website, where I explain about the kinds of things serious hobby breeders want to know about you. 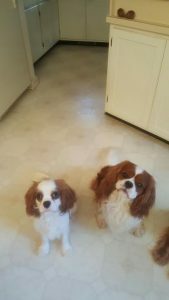 I like a message that gives a little information about the person and the family and what kind of home they would provide for a puppy and what kind of puppy they especially have in mind, and personally I like someone to ask about MVD and SM, thus showing they’ve done some homework about Cavalier health issues. Give me some indication you’re educated about the breed and seriously looking for a nicely bred puppy, and I’ll write back a much more helpful response, including pointers to other reputable breeders when (as is generally the case) I have nothing. First the mother contacted me. We had a nice exchange where I suggested a breeder close to them, but we also discussed Jos. Clearly she had read my description of him on my website because she addressed my concerns about Jos needing a lot of attention, plenty to do, and another playful dog in the family. She asked for more pictures and I sent her several. We emailed back and forth about Jos some more, and about her husband and everyone’s work schedule, and about her kids, and about the remodeling project that will keep them from taking a new dog until June. Then we had a chat on the phone. Then they drove more than six hours just to meet me and Jos and the rest of the dogs, even though they won’t be able to actually take a new dog home for two months. They came with the whole family so I could meet their children. The children were very nice, polite, and good with the dogs. They didn’t ask about price at all, but without discussing it, they did everything right to make me willing to drop my normal asking price significantly. Barring disaster, Jos will be leaving me in June. It will be hard for me to let him go. The only reason I can do it is that I’m confident he will love his new home. If you want a nice, well-bred young adult dog (or a puppy, for that matter) from a reputable breeder, well, I recommend that you set out to make this kind of impression. You can start by raising wonderful children and teaching them to bring little gifts when they visit someone. Showing that you’re willing to drive six hours or more just to meet a dog, yep, that is also impressive.